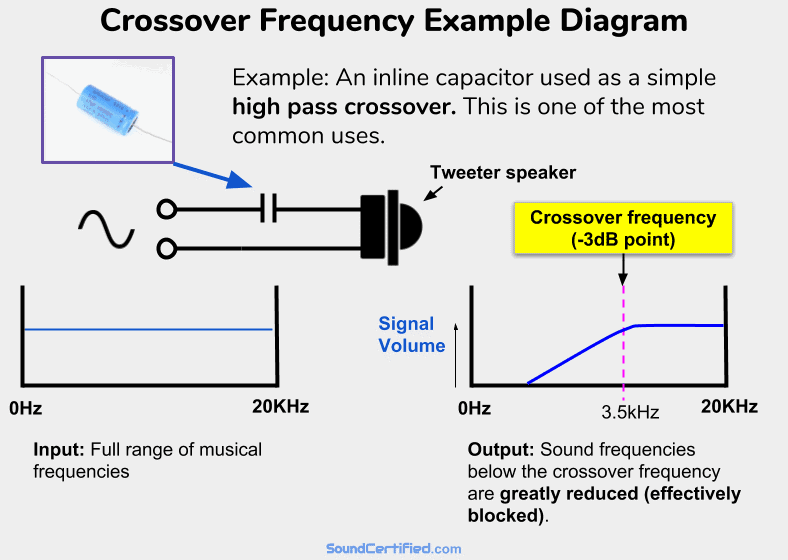 Wondering what crossovers do and what a crossover frequency is? Trust me, I know – it can be a bit confusing at first. 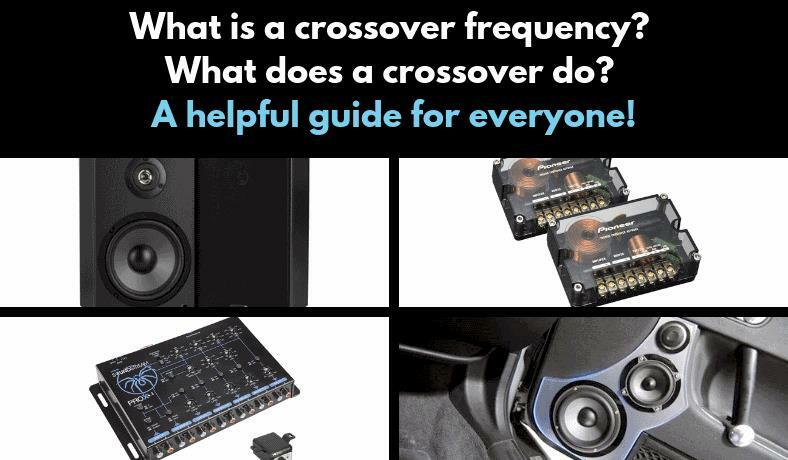 Crossovers are incredibly important for a great-sounding stereo system whether in your home, car, or nearly anywhere that speakers and an amplifier are used. In this detailed post I’ll explain what they are, how they work, and much, much more in a way that anyone can understand. 2. What is a crossover frequency? What does a crossover do? 3. How does a crossover work? 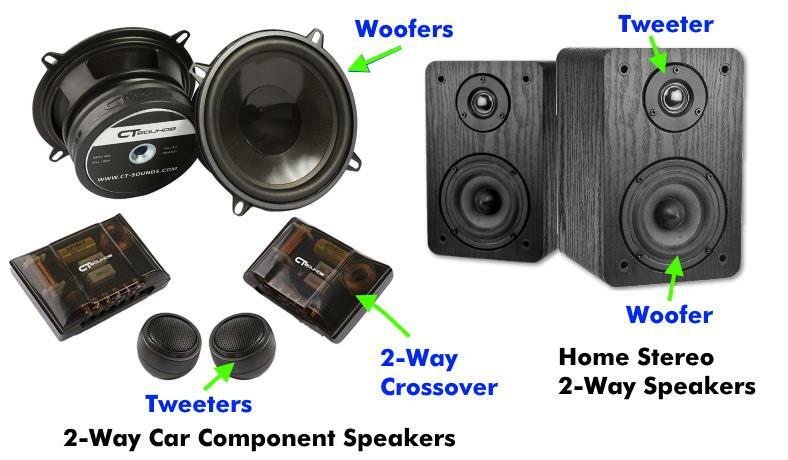 What is a speaker crossover? 4. What are decibels and why do we use them for audio? 5. What is a crossover “slope”? 6. What is a two way speaker? 7. What is a good crossover frequency? What crossover frequency should I use? What is a crossover frequency? What does a crossover do? A crossover works using the principle of electronic filters to filter out (block) a range of musical sound frequencies as desired. When we think about musical signals we don’t always realize the important things going on behind the scenes. In fact, you’ll almost never find a good-sounding speaker system that isn’t using 1 or more types of crossovers. That’s how important they are! 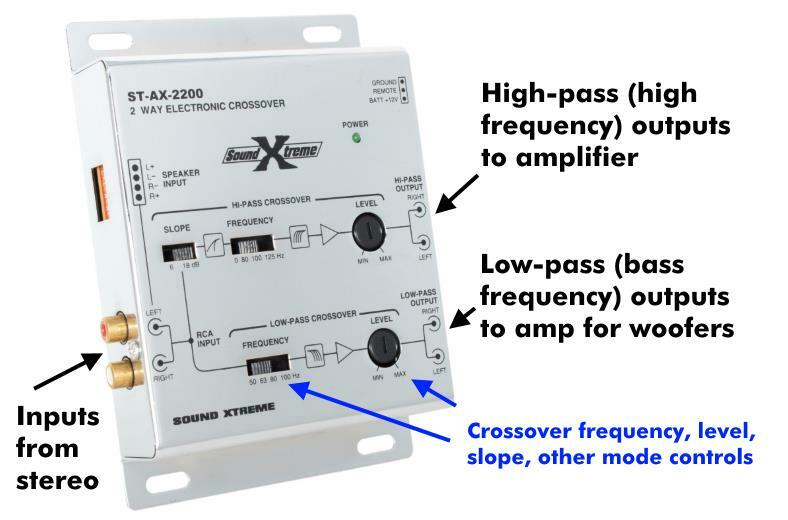 A crossover (audio crossover) is an electrical or electronic assembly that separates a musical sound source and provides outputs best suited for certain types of speakers. Shown: One of the most common crossovers used directly on speakers and the crossover frequency as a real-world example. As tweeters can’t produce bass sounds, they distort and can even be damaged by heavy bass. Using a crossover therefore makes it possible block (filter out) unwanted sounds below the crossover frequency. (Shown is a typical frequency used at 3,500 Hz [3.5 KiloHertz]). The crossover frequency is the sound frequency point at which sounds after that will be greatly reduced, effectively blocking them. We use it as a reference point at which the output to a speaker (or the input to an amplifier, when using active crossovers) is reduced by 3 decibels (-3dB). Normally the crossover frequency is used as a starting point in mathematical computations for crossover design. In the world of electronics, it’s also sometimes called the corner frequency or cutoff frequency. All sound frequencies after the crossover frequency are cut more and more past it, with an increasingly steep reduction – to the point where they’re almost completely blocked. In other words, a crossover filters out a range of sound you’d like to prevent reaching speakers, starting at the crossover frequency. What does sound “frequency” mean? In this simple diagram you can see what I mean by “frequency.” After all, the word simply means “how many times something happens.” Likewise, sound frequencies are assigned a number by the number of times they occur per second. When we talk about “frequency” we’re referring to a number range for the human ear. For math & engineering purposes most of the time we use the range of 20 to 20,000 Hertz (20 to 20 KiloHertz, or 20 thousand Hertz). In reality, the human ear con only hear down to around 30 Hz and near 16 KiloHertz, although it depends on your ears. 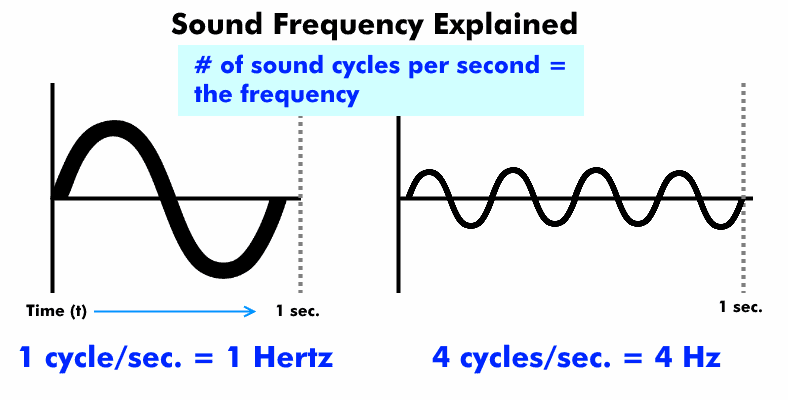 Hertz is a label used to represent frequency in terms of cycles per second. It’s because all sound waves (and electronic audio signals too) are alternating waves that happen many times per second. “Hz”, “KiloHertz”, “KHz” are shorter ways of writing it (Kilo = the thousands marker, as you might recall from math class). How does a crossover work? What is a speaker crossover? As I mentioned earlier, there are 2 kinds of crossovers. That’s true even if they’re built into an amplifier or speaker cabinet itself. The same basic designs are used just in a different package. A typical example of a separate electronic (“active”) crossover. In this example of a separate crossover used with car stereo amplifiers (nearly identical to those used in home stereos, too) you can see the RCA jack audio inputs and the crossover’s adjustable/switchable outputs. One set of output jacks provides a high-pass signal to connect to an amp for driving tweeters or full-range speakers while blocking bass. The 2nd output is for providing a bass-only signal to the amp for woofers. A typical car amplifier’s built-in electronic crossover circuitry, illustrated. Sometimes called the “front end”, an amplifier’s internal crossover section is made up of a few basic electronic parts: Variable resistors, operational amplifier chips, capacitors, and fixed value resistors. They’re designed just like separate crossovers to give adjustable features & variable crossover frequency settings. 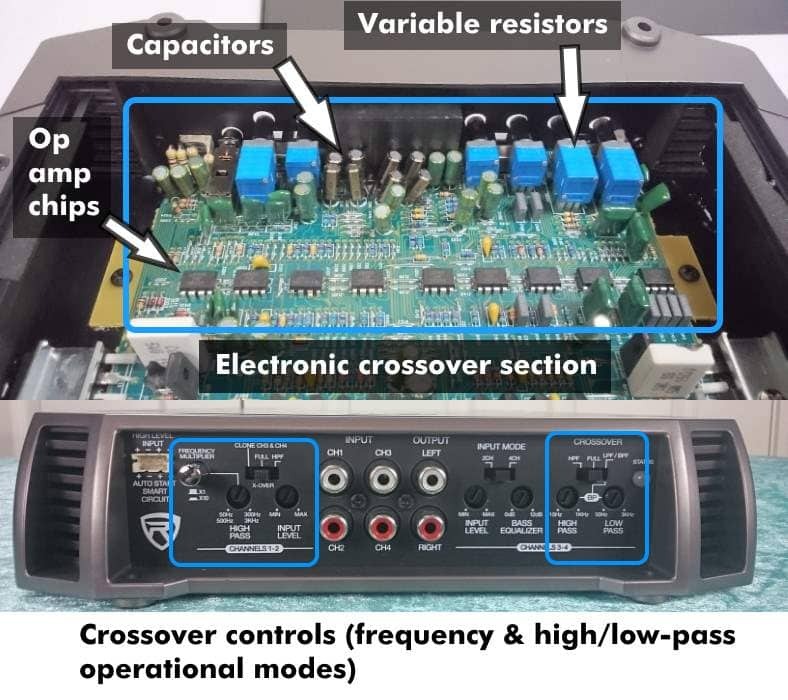 Electronic crossovers are also sometimes called “active” crossovers as unlike speaker crossovers, they need a power supply connection to work. Also, unlike speaker crossovers they’re used before an amplifier. While speaker crossovers connect directly to the higher-power output terminals of an amp and then to speakers, electronic crossovers work only with small signals. They’re connected to the outputs of a stereo in most cases. Left: A typical operational amplifier (Op amp) integrated circuit (IC), the Texas Instruments TL072. Right: An example of a low-pass crossover circuit using an op-amp to filter out high frequency sounds. Electronic crossovers may sound very complicated (and they are, at least in some ways) but they’re actually based on pretty basic principles. They work using a variety of electronic filter circuits based around a very common electronic component: the operational amplifier (“op amp”). 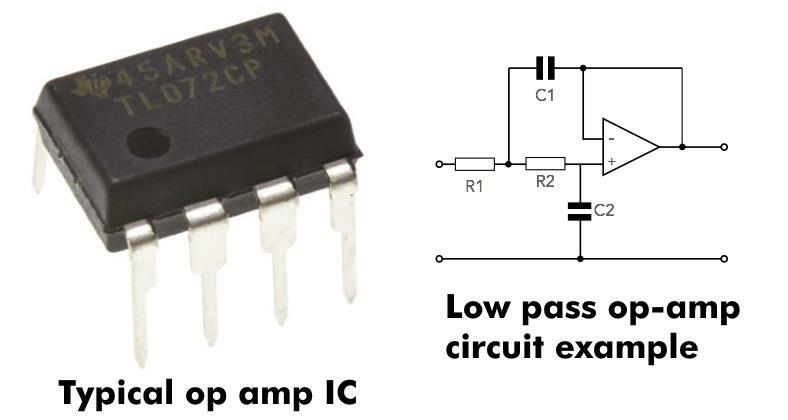 Op amps are tiny multi-purpose amplifiers that are very useful for amplifying or changing an input signal in many ways. They, together with resistors and capacitors, can be used to control how a music signal is output and will block certain ranges of frequencies. A schematic of a typical electronic crossover. In this case, the left stereo channel of an Alpine car amplifier’s built-in crossover circuitry is shown. When put together in a way in which you can select your preferred filter (high or low pass, for example) and adjust the crossover frequency they form a complete crossover unit. Basically, they offer several adjustable filters so you can prevent a range of musical frequencies from going to the wrong speakers. The crossover frequency is usually adjustable using switches or dials to allow you to change it as you like. High-pass outputs to block bass from tweeters or to block low-end bass from main speakers. This allows more volume without distortion as small speakers can’t handle heavy bass well. Low-pass outputs for bass: When used, this blocks the vocals and other higher frequency sounds that woofers and subwoofers can’t reproduce well. The result is good, clear, heavy-hitting bass. Top: A typical car stereo speaker crossover, with the main parts labeled. Bottom: A typical home stereo speaker crossover, which is extremely similar. 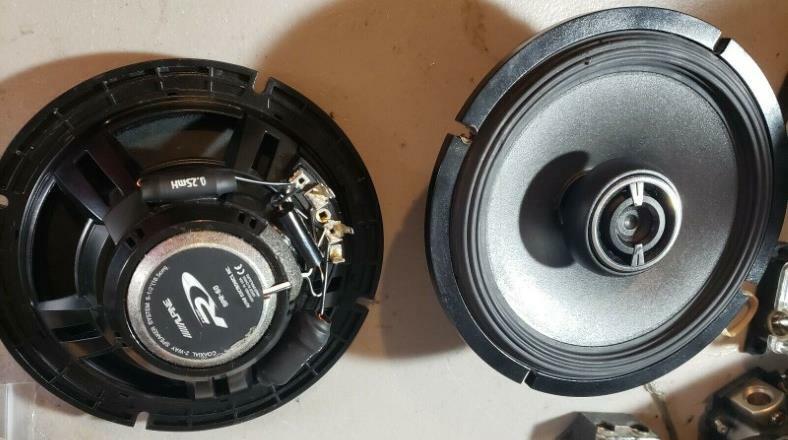 (These are normally installed inside the speaker cabinet) Both use capacitors and inductors to form crossover filters and control the sound sent to tweeters, midrange speakers, or woofers for best audio sound quality. Speaker crossovers are sometimes called “passive” crossovers as they don’t need an external power supply connection. 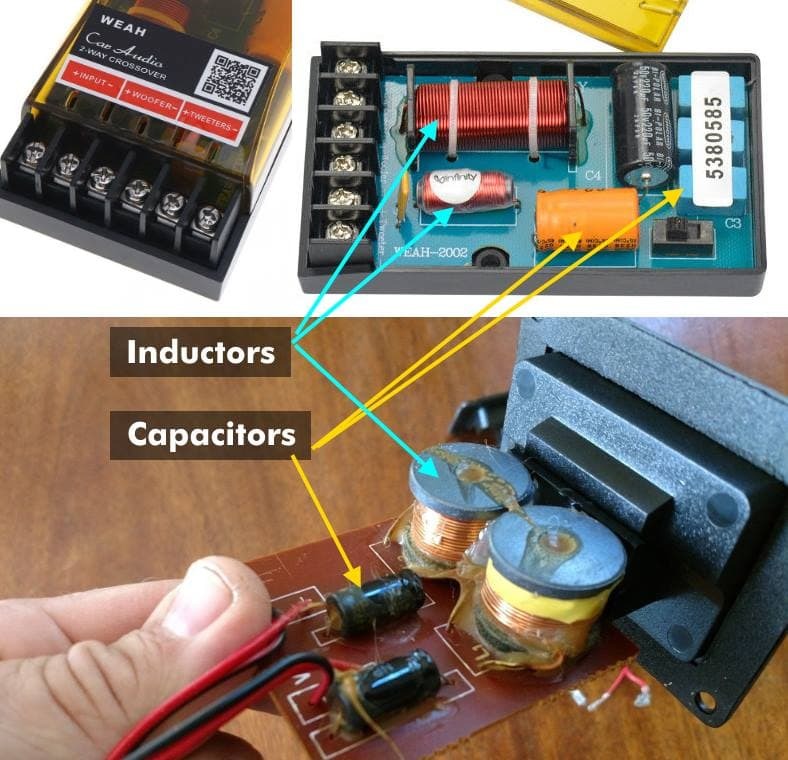 They work using passive components: capacitors and inductors. A speaker crossover is an electrical circuit that uses inductors and capacitors to filter a speaker signal and split it among 1 or more outputs. The outputs depend upon the frequency response of the speakers used. Unlike electronic crossovers, normally they’re connected to the outputs of an amplifier and then to the speakers you’d like to use. 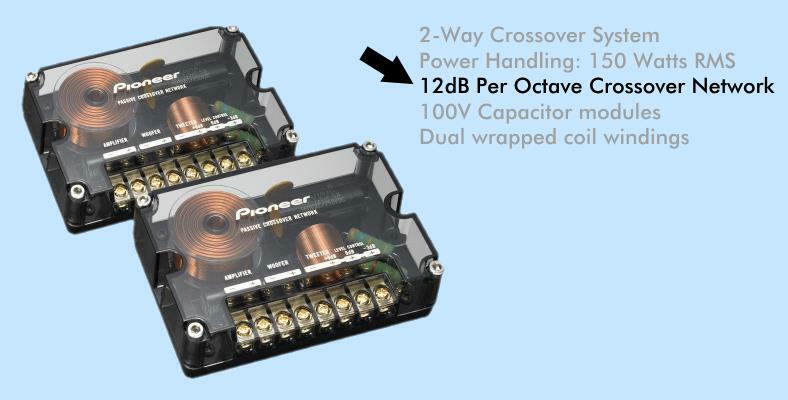 One of the most common speaker crossover types in use today: A 2nd-order 2-way speaker crossover with tweeter and midrange/woofer outputs. Inductors are represented with an “L” symbol and capacitors with a “C” symbol. A “2nd order” crossover just means that a second stage of parts are used to make the crossover filter out the unwanted frequencies even more effectively. Capacitors have more “resistance” (called impedance, in this case) to a low-frequency signal than a higher one. The lower the frequency, the less signal that is allowed to pass. Inductors are coils of wire that have more resistance to a high frequency signal than a lower one. Therefore they filter out higher sound frequencies. This works because when a capacitor or inductor has a signal applied to it that’s past the crossover frequency (depending on how it’s used), the resistance increases, which reduces the speaker voltage. This means the speaker will receive less and less of the speaker signal that we want to block. In all cases, the part value is chosen according to the speaker “Ohms” (impedance rating) it’s planned to be used with. That’s super important! Note: Speaker crossovers can only be used with the speaker impedance they’re designed for, or they won’t sound the same. For example, using an 8 Ohm home speaker crossover with a 4 Ohm car speaker won’t work correctly. That’s because the part values were chosen for one impedance only. When you change that, it dramatically changes the crossover frequency! When used in series with a tweeter, tweeters filter out damaging and distorting bass that tweeters can’t handle. 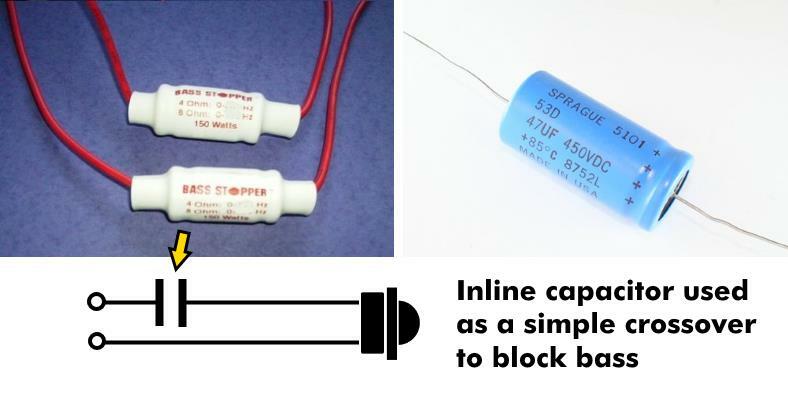 Capacitors like in this example can be used as a simple speaker crossover for tweeters. Speaker crossovers are designed in many ways but all have the same basic design structure – only the details change. They’re also often labeled with names like “1st order”, -6dB/octave, “2nd order”, -12dB/octave, and so on. I’ll explain a bit more about that as we go. For now, you only really need to know that 2rd order and 3rd order crossovers are the same thing but with more crossover stages, or “orders”, added to make the filtering ability even more effective. What are decibels and why do we use them for audio? Crossovers (and a lot of other audio electronics & equipment) are measured using Decibels. Decibels (“dB”) are a convenient mathematical way of dealing with numbers that occur as powers of 10, unlike linear numbers, which occur in a straight line. Shown is an example of figuring out the reduction, in dB, of a crossover output. In the real world, lots of measurements deal with things that don’t increase or decrease in a straight line (“linear”) but instead on a curve (“non-linear”, or logarithms). I won’t bore you with heavy math here, but we use Decibels in the world of audio as a mathematical way of dealing with musical electrical signals. That’s because a lot of it happens not in a straight line but in curves. That is, much of the audio world works with powers of 10 (logarithms, which you might remember from your algebra class). Hence the need for a way to deal with those – that’s where the dB representation comes in handy. And it’s not just crossovers that work with decibels but even your own ears are “logarithmic”! That is, the volume your ears perceive is measured in dB, too. What is a crossover “slope”? Diagram showing the crossover slope, or cutoff steepness, for the most common crossover types. Crossovers have “orders” – that is, 2nd, 3rd, or more stages that increase their ability to filter out the unwanted sounds frequencies sent to a speaker. A crossover slope is the steepness of a crossover’s filtering ability. In other words, it’s how much a crossover’s blocking (filtering) ability is past the crossover frequency point. As you might have guessed, the larger the steepness (greater the slope), the more effective the crossover is at filtering out bass sent to a tweeter, as an example. Likewise for other speakers connected to it. In the audio world we commonly refer to frequencies in octaves. An octave is a doubling or halving of a frequency number. 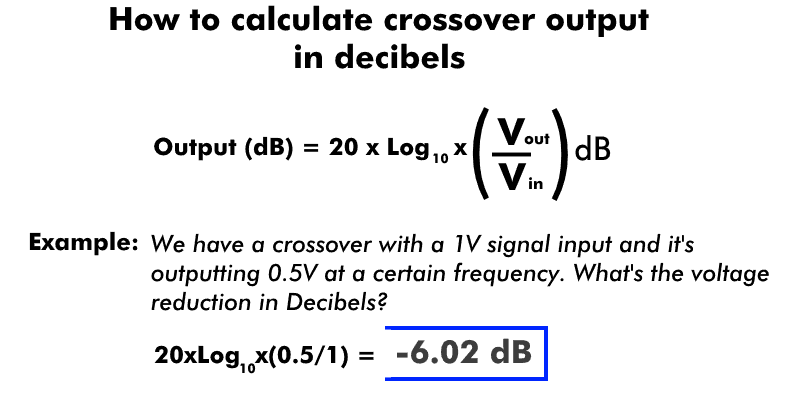 For example, when we refer to a crossover having a cutoff of -6dB per octave, we mean it will continue to cut the input signal more by a factor of 6dB for every doubling of the previous frequency. Like this: (Low pass crossover frequency) -6dB @ 1KHz, -12dB @ 2KHz, -18dB @ 4KHz, -24dB @ 8KHz, –32dB @ 16KHz, up to 20KHz. What are the most common and best crossover slopes? There’s a lot more to say here, but crossovers are designed to be a good compromised between complexity, price, and sound quality. While you might think “the higher order, the better” would always apply, things get much more complicated once you get past 3rd or 4th order crossovers. Generally speaking, a -12dB crossover slope is one of the best compromises and works well for most speaker systems used today. One reason is that it’s simple. has fewer design complications, but still gives a good cutoff ability that works great both for single speakers or 2-way speakers. Electronic and 2-way speaker crossovers are nearly always -12dB models. What is a two way speaker? 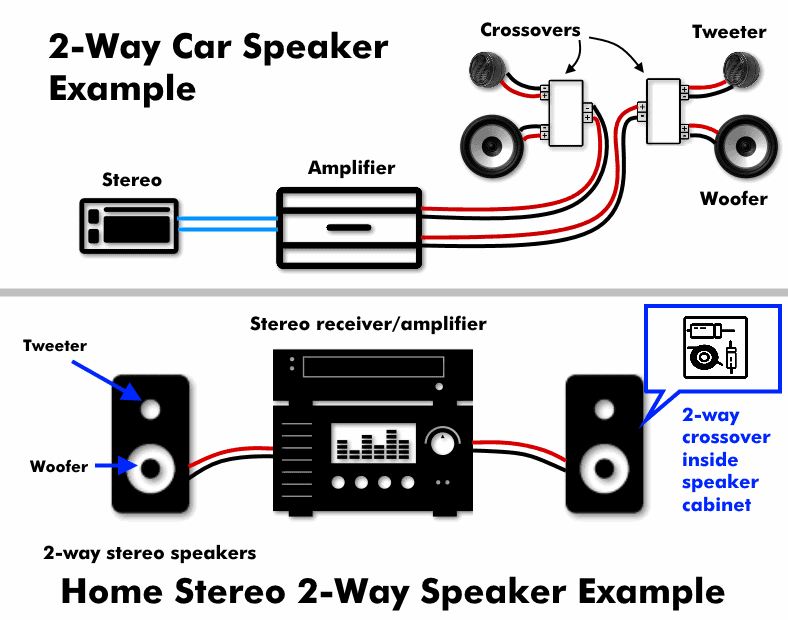 Examples of very common 2-way speakers you’ll find in either car or home stereos (in addition to other types as well). 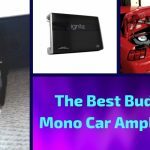 They have nearly the same things in common except that home stereo speakers are usually placed in a speaker box (speaker cabinet/enclosure) while car speakers may be installed separately in many cases. Both use a 2-way crossover to produce very nice sound. What are 2 way speakers? 2 way speakers are a speaker system in which 2 speakers work together to produce the full range of sound. Audio from a stereo amplifier is divided between the speakers by a 2-way speaker crossover. These types of speakers use a tweeter for high frequencies and a woofer speaker for the midrange and bass portions of music. 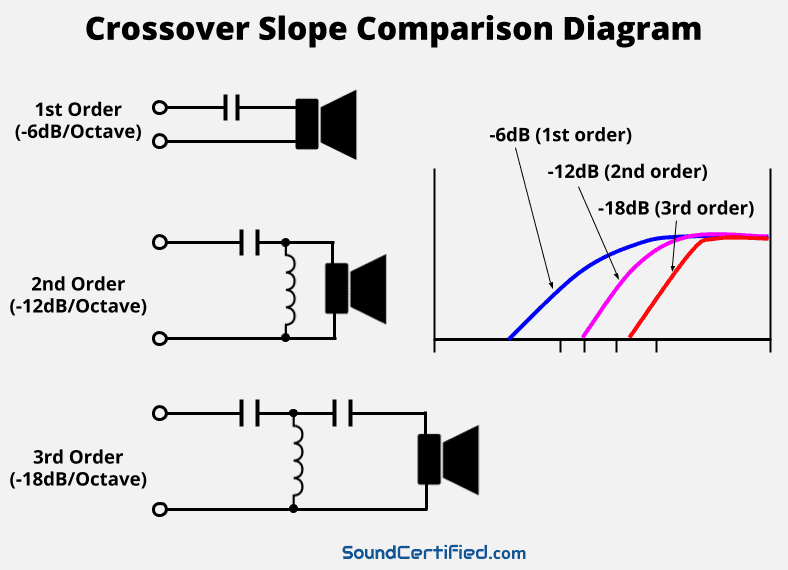 While the type of crossover varies from model to model, one of the most common and best-performing is the 2nd order crossover with a slope of -12dB per octave. 2-way speakers use 2 speakers on each channel and a crossover to divide the audio frequencies reproduced between the two. Each speaker receives a signal range it’s best suited for. The crossover frequency used varies by design needs, to there’s no “one” crossover frequency that works in all cases. Additionally, crossovers must be matched to the right impedance (Ohms rating) for the speakers they’re design to work with. The 2-way crossover evenly splits the incoming sound and sends it to the correct speaker such as the tweeter and a woofer. Coaxial speakers are 2-way speakers, too. In fact in the example shown here you can see crossovers on the rear of the speaker. Just like separate crossovers, lower frequencies are directed to the large woofer and highs are sent to the tweeter. The result is that the sound produced is a full range of sound, but without distortion or poor performance you’d get when trying to play the same range in only 1 speaker. In other words, a 2-way speaker design can produce clean, detailed sound. In many systems, you won’t necessarily need expensive components or speakers to get great sound. Even low-cost 2-way speakers can sound very nice! What is a good crossover frequency? What crossover frequency should I use? The truth is, there’s no good set of crossover frequencies that work for every speaker. It depends on a lot of things. However, here are some of the most common frequencies that work well in many cases. This is based on my experience with speaker design and many stereo installations. Car or home subwoofer 80 Hz (low pass) Good low-pass frequency for subwoofer bass without including midrange sounds. Ideal for low-end bass. Car main speakers 56-60Hz (high pass) Blocks low-end bass that causes distortion or speakers to "bottom out." Great compromise between full-range sound and midrange bass capability. Tweeters or 2-way speakers 3.5KHz (high pass, or high/low-pass) Most 2-way or 1-way (tweeter) crossovers use a freq. near this as most do not perform well below this general range. Same for woofers above this range. Midrange/woofer 1K-3.5KHz (low pass) Woofers and many midrange speakers do not perform well above this general range. They're very poor for treble and a tweeter should be added. 3-way system 500Hz & 3.5KHz (Woofer/tweeter crossover points) Similar to 2-way systems the upper freq. would be the same. Midrange drivers in a 3-way system often do not perform well below 500Hz or 250Hz in many cases. Want to learn a lot more and truly understand speakers, crossovers, and how to design a great sounding system of your own? Here’s the very book I learned a lot from myself. 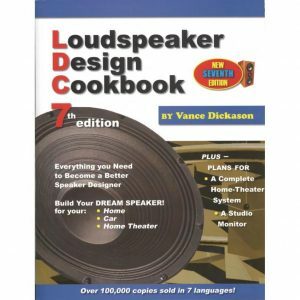 You can pick up your own copy of the famous Loudspeaker Design Cookbook at Amazon today. It’s an excellent source of information including formulas you too can use to build your own car or home loudspeaker projects. Interested in learning more about what tweeters do and the different kinds? Check out my wonderful guide to tweeters here. For some great articles about crossovers, speakers, and lots of DIY projects, check out the Elliot Sound Products page. Did I leave anything out? Drop a note! I hope you’ve found my post helpful, clear, informative, and most of all what you were looking for. If you’ve still got questions, suggestions, or just want to say hi, leave a comment below or send me a message from my contact page.